Discovery of the bones at Tabor Hill. Toronto Telegram, August 18, 1956. On August 17, 1956, while levelling land to make way for a new subdivision, a power shovel ripped into the side of Tabor Hill, northeast of the intersection of Lawrence Avenue and Bellamy Road. According to the next day’s Globe and Mail, “about 100 feet of earth were sliced from the hill before the shovel gouged out a pocket about four feet below the surface. The hole, about seven feet wide and one foot deep, was crammed with bones.” The shovel had uncovered a centuries-old burial pit, one of the earliest ossuary sites in Ontario. “We should have charged admission,” one workman told reporters as Scarborough residents were crowding the site to see the unexpected discovery. Local children reportedly began digging in the surrounding area, finding additional bones buried only a few inches below the surface. 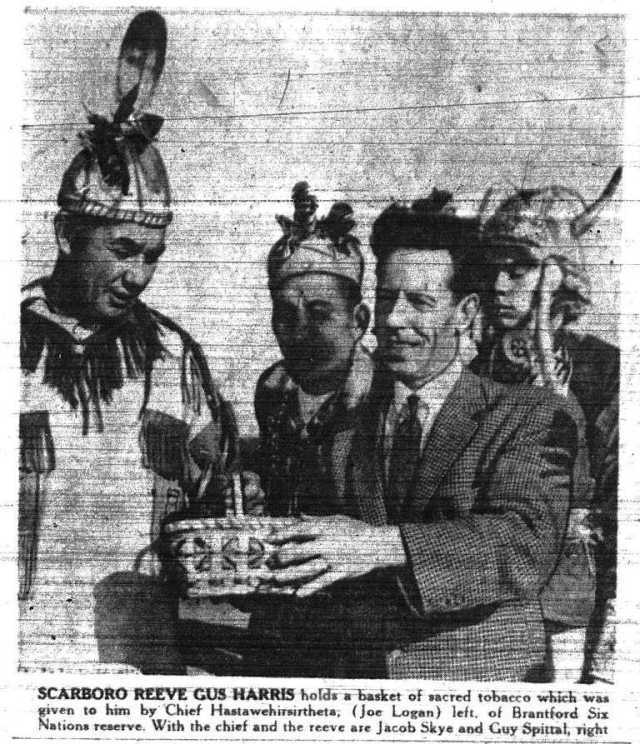 Scarborough reeve Gus Harris, receiving tobacco from Joe Logan of the Brantford of the Brantford Six Nations reserve. Toronto Star, October 20, 1956. Harris moved quickly. 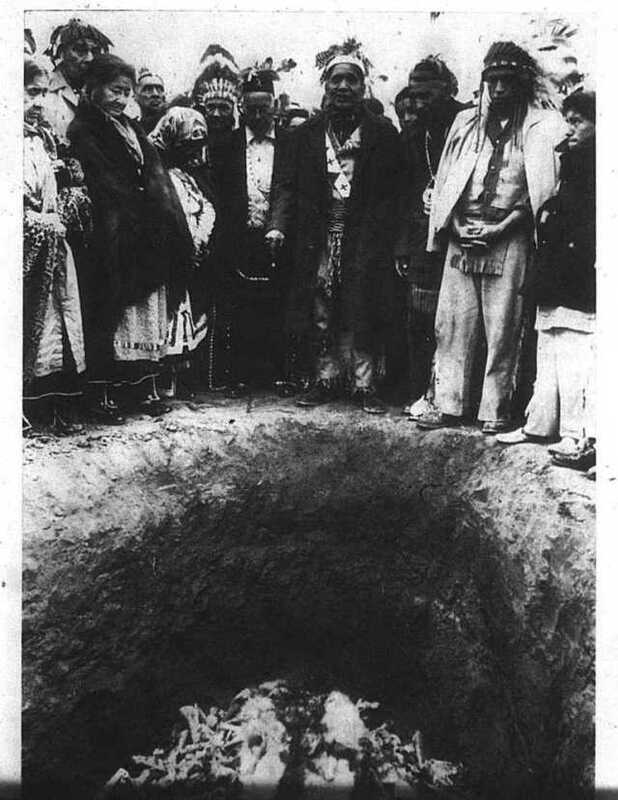 On August 28, just 11 days after the ossuary was discovered, the Globe and Mail reported plans for a large event to be held in October, described as the “ancient Iroquois burial ceremony, the Feast of the Dead.” Harris, the Globe continued, had met with several representatives from the Six Nations reserve near Brantford, and together they initiated plans for the October event. The intention, according to the press, was to rebury the bones at Tabor Hill according to the traditional Feast of the Dead ceremony, in accordance with a ritual which, reportedly, was not known to have been performed in Ontario for several hundred years. “Sprinkling sacred tobacco” prior to the 1956 reburial. The Globe and Mail, October 20, 1956. Over the next few weeks, representatives from the Iroquois worked on planning the event, with support from Scarborough Township. In addition to costs covered by the Township, close to 20 local motel owners reportedly donated some of their rooms free of charge, or offered discounted rates for any Iroquois attending. 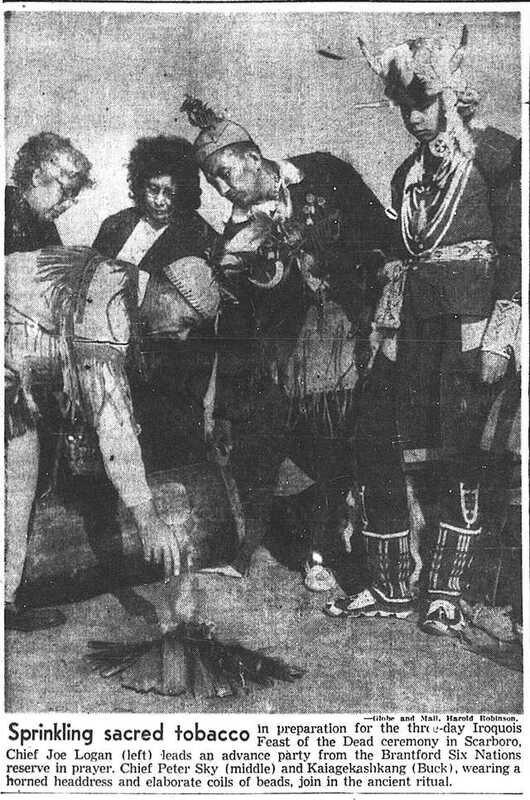 The resulting event was staged from October 19–21, and accounts suggest that it was attended by more than 200 Iroquois, with several thousand outsiders observing the ceremony, including journalists and various government officials. 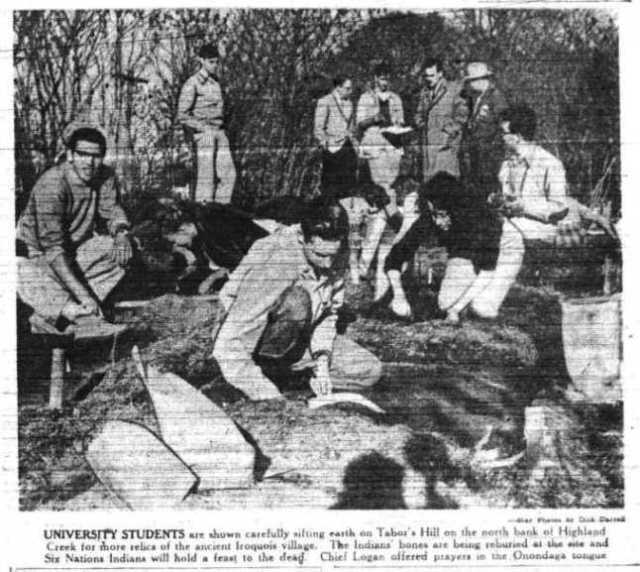 In a 1958 anthropology paper describing the 1956 reburial ceremony at Tabor Hill, Robert William Dunning writes that “the township officials did everything in their power to insure the authenticity of the ceremony.” This proved impossible, however, and “almost from beginning to end the ceremony was organized for the particular occasion,” as opposed to being purely traditional. The Iroquois Feast of the Dead, Dunning notes, is a sacred ceremony which is not open to outsiders; the public nature of this event meant that some Iroquois representatives were reluctant or unwilling to participate, and decisions needed to be made by the organizers as to which parts of the ceremony could be conducted publicly. Allowances also had to be made for translating or explaining certain aspects of the ceremony to the English-speaking public, and for the opportunity for speeches by non-Iroquois officials. On October 19, a small group conducted a preliminary ceremony at Tabor Hill. The Star wrote that “sacred tobacco was burned and the smoke, according to Iroquois custom, carries a message to the Great Spirit.” The same group then reportedly visited a nearby archeological site that had only recently been discovered a few kilometres to the west, near where Highland Creek meets Brimley Road. University of Toronto students had just begun digging at this site, and eventually found more than 1,000 artifacts including pottery fragments, tools, and projectile points. U of T students working on the site located just west of Tabor Hill. 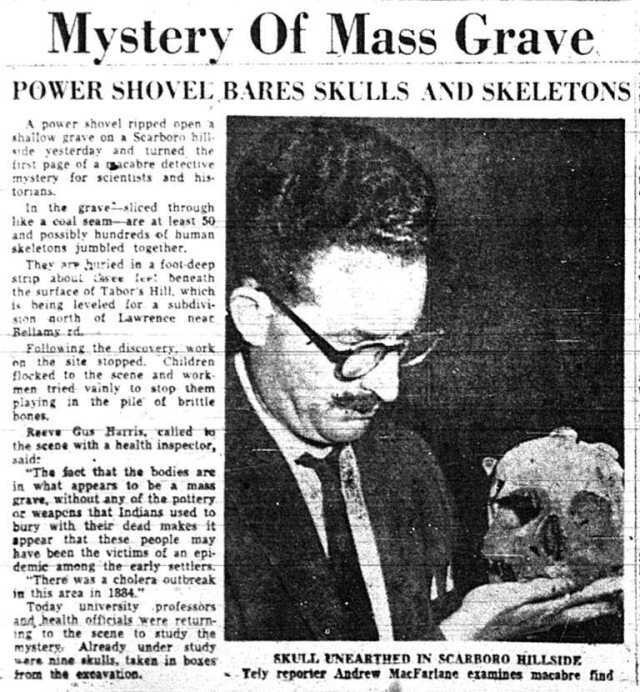 Toronto Star, October 20, 1956. While corn and beef soup was prepared in two large cauldrons over a fire, a new hole was dug for the re-internment of the bones. According to Dunning, the digging was initiated by six of the chiefs. “Workers changed often. It was difficult digging in the hard packed loam and clay. When the pit neared five feet in depth, the members of the press stepped in and volunteered to finish the job.” When the new pit was ready, the spectators were moved back, and the Iroquois representatives reburied the bones, laying wolf pelts flat on top. The reburial of the bones at Tabor Hill. The man in the centre is identified as David Thomas, an Onandaga chief who spoke at the ceremony. Life, November 26, 1956. 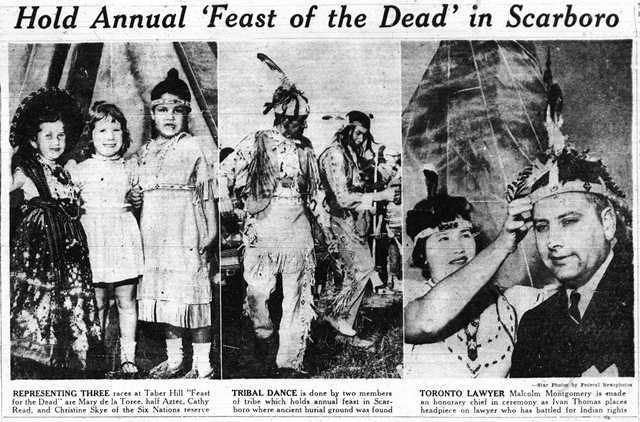 In 1958, Robert William Dunning published his detailed description of the 1956 Feast of the Dead ceremony at Tabor Hill, apparently drawing on numerous interviews, observations, and published documents. He claims that the site is not actually an Iroquois site at all, given that “the large ossuary type burial was not known to the Iroquois Nations, but was practised by some outside tribes including the Hurons.” Dunning takes it as given that the Tabor Hill site is, in fact, Huron-Wendat. The Tabor Hill is accepted today as a Wendat site. Photos from the first Feast of the Dead ceremony at Tabor Hill. Gus Harris is seen at left. Toronto Telegram, October 22, 1956. Some of the historical confusion about Tabor Hill may be connected with use of the word “Iroquois.” While “Iroquois” is often used to refer to the group also known as the Six Nations or the Haudenosaunee, it has also been used in an archaeological context to refer to a larger group of First Nations peoples whose languages and culture shared some common characteristics, but who were clearly different peoples; this larger group includes the Haudenosaunee, but also the Wendat and other peoples. For this latter meaning, the term “Iroquoian” is now preferred, but earlier sources sometimes used “Iroquois” in both contexts. Photos from the annual Feast of the Dead ceremony at Tabor Hill. Toronto Star, September 22, 1958. Additional material from: Robert R. Bonis, A History of Scarborough (Scarborough Public Library, 1968); R. Wm. Dunning, “Iroquois Feast of the Dead: New Style,” in Anthropologica, No. 6 (1958); J. Norman Emerson, “The Village and the Cemetery” in Ontario History, Vol. 48, No. 4 (Autumn 1956); The Globe and Mail (August 18, August 20, August 22, August 28, September 12, September 25, October 15, October 19, October 20, October 22, December 1, 1956; February 9, October 26, 1957; May 9, July 1, 1958; April 5, 1960; March 22, July 18, September 6, 1961; October 28, 1963); History of the Tabor Hill Ossuaries in Scarborough and a Proposal for an Authentic Iroquois Indian Village (ca. 1960: Scarborough); Walter A. Kenyon, “A Prehistoric Cemetery” in Ontario History, Vol. 48, No. 4 (Autumn 1956); Life (November 26, 1956); T. F. McIlwraith, “The Feast of the Dead: Historical Background,” in Anthropologica, No. 6 (1958); The (Scarborough) Mirror (November 2, November 9, 1966); Marit K. Munson and Susan M. Jamieson, ed., Before Ontario: The Archaeology of a Province (McGill-Queen’s University Press, 2013: Montreal & Kingston); Barbara Myrvold, The People of Scarborough: A History (The City of Scarborough Public Library Board, 1997); The Toronto Star (August 18, August 22, August 28, September 24, October 3, October 19, October 20, 1956; February 9, 1957; September 22, 1958; January 5, April 5, September 17, 1960; September 12, 1961; November 4, 1966; November 3, 1981; May 27, 1998); The Star Weekly (November 17, 1956); The Telegram (August 18, October 22, 1956); Ronald F. Williamson, “The Archaeological History of the Wendat to AD 1651: An Overview,” in Ontario Archaeology, Vol. 94; Ronald F. Williamson and Debbie A. Steiss, “A History of Ontario Iroquoian Multiple Burial Practice,” in Bones of the Ancestors: The Archaeology and Osteobiography of the Moatfield Ossuary (Canadian Museum of Civilization, 2003).